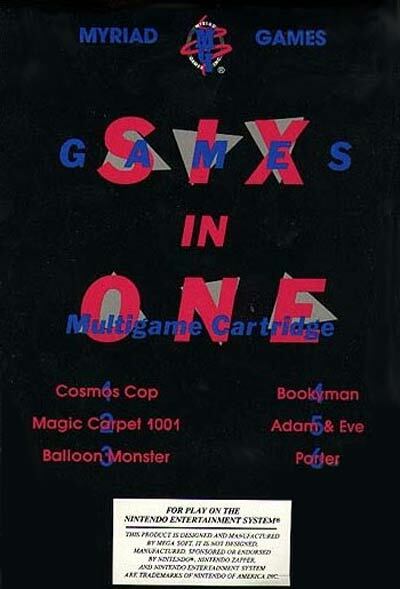 The six games on the cartridge are: Bookyman (A clone of Williams Electronics and Kural's arcade game Make Trax/Crush Roller), Adam and Eve (A single-screen platform game similar to Nintendo's Balloon Fight, in which you have to kill snakes by bursting the balloons attached to their heads), Cosmos Cop (A pseudo-3D into-the-screen shoot-em-up, similar to Sega's Space Harrier in a futuristic setting), Magic Carpet 1001 (A side-scrolling shoot-em-up), Balloon Monster (A clone of Buster Bros), and Porter (A puzzle game similar to Thinking Rabbit's Sokoban, in which you have to move boxes into a specific place). Soon after Caltron produced their 6 in 1, possibly due to some financial trouble, they sold their remaining stock to a Texas-based video game company called Myriad Games, Inc. Myriad Games re-released the 6 in 1 with their own label placed over Caltron's label, and with a new manual and box. Each respective cartridge and box of this re-release has a serial number, and the highest number found has been 888, according to the Digit Press rarity guide, making the Myriad version the rarest commercial NES game released in North America.